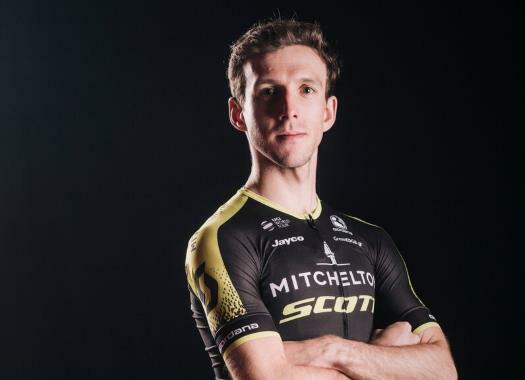 Simon Yates (Mitchelton-Scott) has kept the lead of the General Classification after finishing the tenth stage with the peloton. Despite expecting weather factors to have an influence on the day and mechanical problems, the Briton could stay with the main pack until the end of the stage. "It could have been much, much worse today, we were expecting a bit more of a crosswind, but it was more of a headwind so it was ok," said Yates at the finish line. "I was just on the side of the road and I must have hit something or run over something and I had a double puncture which is not ideal but it could have been much worse. I’ve had some bad experience before having a puncture and waiting, then changing for my own bike or the wheel. Today we changed for Michael Albasini’s bike and it was a little too big, so we had to change again, but it was ok."
The day was uneventful for the rider and some attacks he was expecting never came. "It was quite a relaxed day and really nothing happened once the breakaway went away," Yates explained. "The sprinters did all the work today, so full credit to those guys and for us, it meant a relatively easy day. "I wasn’t sure if there would be any attacks coming from Valverde, but in the end, there wasn’t and that’s ok."